As you might have seen, we’ve been a bit maths crazy here lately! So I thought I’d show you some of the ways I’ve been setting out materials for the girls to encourage some maths exploration. They are all simple and for most you could use whatever you have at home, or even what you can find outside! Often, just presenting the materials differently provokes new exploration and ideas. 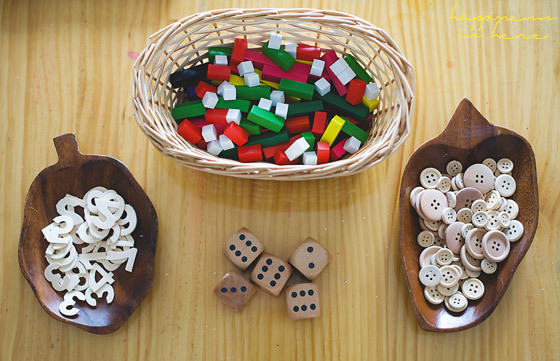 These materials are always available on the maths shelf (cuisenaire rods, wooden numbers, buttons, and dice) and just by setting them out together, new play and learning emerges. Miss 5 used the above materials for ordering numbers, connecting numerals and quantities, subitising, sorting and classifying, making patterns, and comparing length and circumference and ordering accordingly. 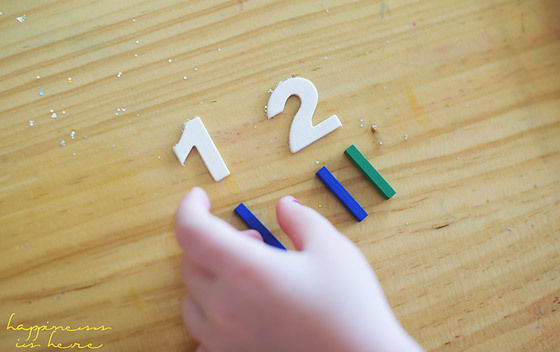 Wooden numbers and Spielgaben sticks. Miss 3 used the sticks to count and represent each number. 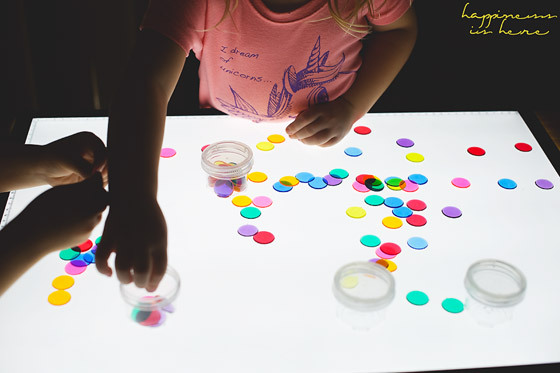 Counting and sorting transparent discs on the light table. You can even do something as simple as leaving out a board game. 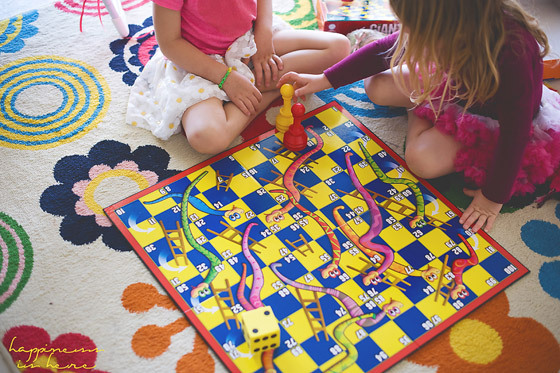 Games like Snakes and Ladders are great for practicing counting! 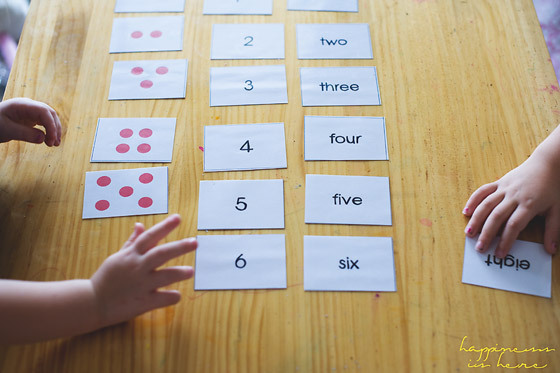 The girls enjoy these free printable number cards and it’s always a team effort with my 3 year old ordering the dots and numerals and my 5 year old matching up the words. 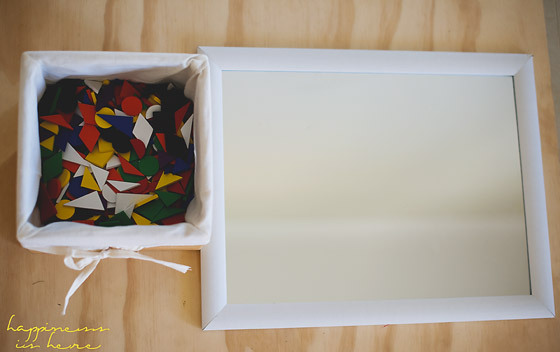 Spielgaben shapes and a mirror for making patterns and pictures. I find that it doesn’t take much to get my kids interested in patterns. 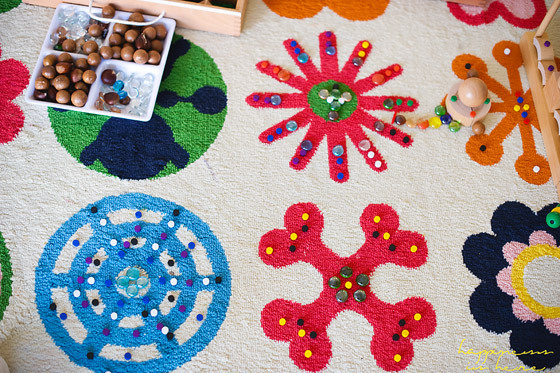 They naturally explore patterns through their play all the time, particularly with loose parts. 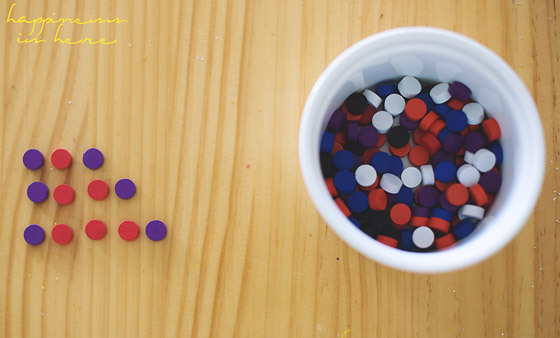 A simple invitation to explore growing patterns using Spielgaben dots. 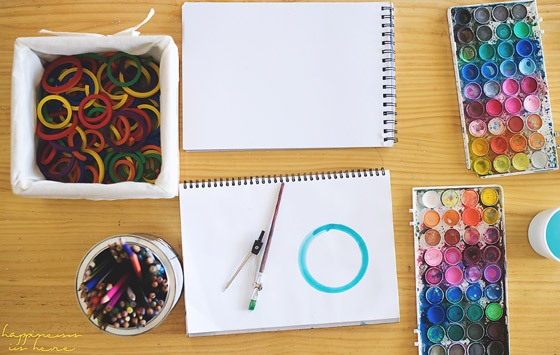 An invitation to draw and paint circles using watercolours, a mathematical compass, Spielgaben circles, and pencils. I’ve talked about block play before. Block play is fabulous for hands on understanding of mathematical concepts. And they’re learning it all through play! I provide many opportunities for block and loose parts play and it’s easy to see all the fabulous things they are learning. Just set out a couple of baskets of blocks and that’s it! Miss 5 is very big on symmetry. Measurement provocation using tape measure, ruler, cuisenaire rods, Spielgaben sticks, lengths of wool, paper and pencil. 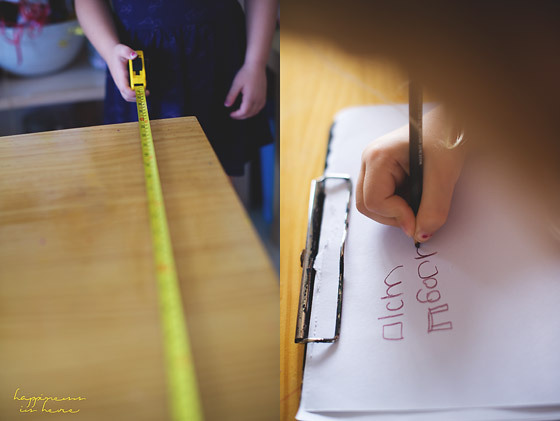 The girls measured the materials on the table and other things around the room, and Miss 5 even recorded her measurements. We have some lovely scales on the maths shelf, and most people have kitchen scales in their house. 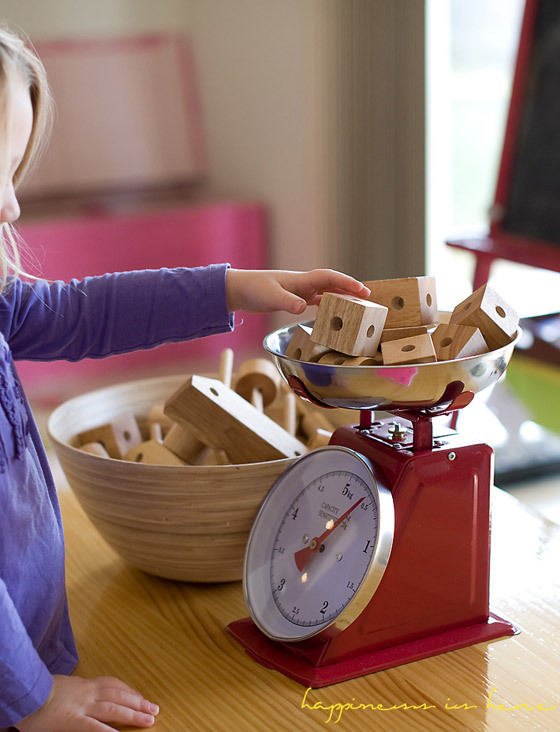 Pair them with some blocks and other objects to encourage weighing and comparing objects based on weight. 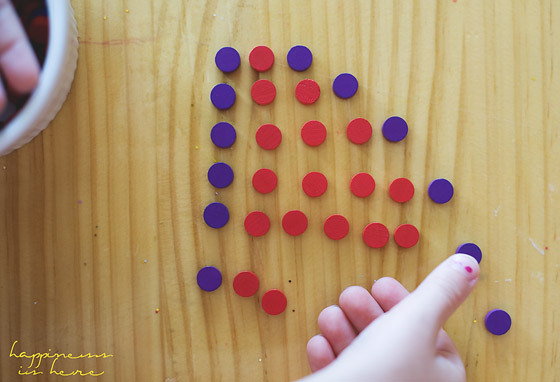 There are so many ways to encourage a love of maths, it’s everywhere! 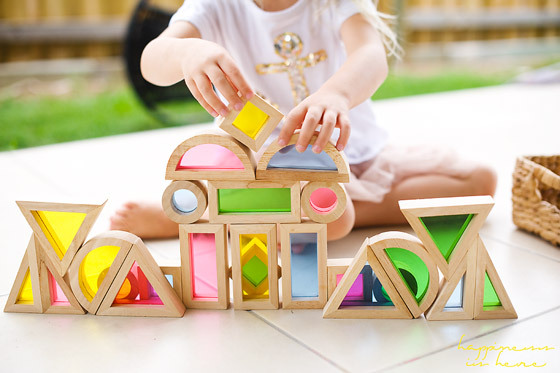 Use whatever you have, leave some new or old materials out for them to find and play with. You could collect sticks and rocks and count them, take a calculator along to the shops, let your child handle the money when you’re paying for your groceries, or do some cooking and let your child measure all the ingredients! 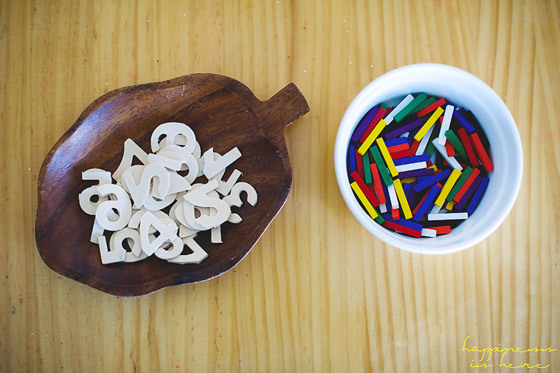 What’s your favourite way to include maths in your day? The new Spielgaben version 4 will be retailed at US $449.50 But Happiness is here readers can own it for over 12% off with a discounted price of US $395 including shipping. Prices are approximate depending on conversion rates. All you need to do to claim your discount is send an email to info@spielgaben.com mentioning Happiness is here and you will be provided with a discount coupon! Oh I love your gorgeous scales… and the wooden numbers! 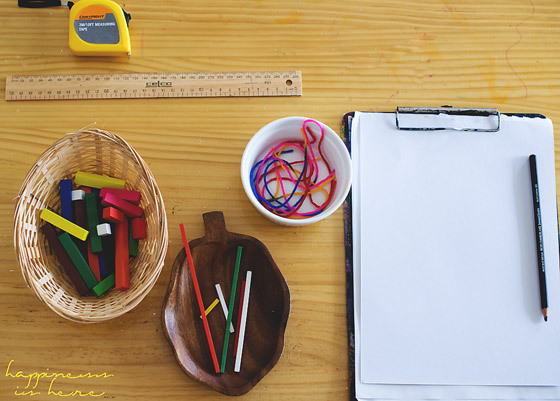 What lovely activities and ideas! Love your post. Always gives me such great ideas… The new Spielgaben is a dream… WE have version 2.0 and have recently ordered the expansion kit with all the 3D stuff and teh peg board. Should ship any day now, so exciting! 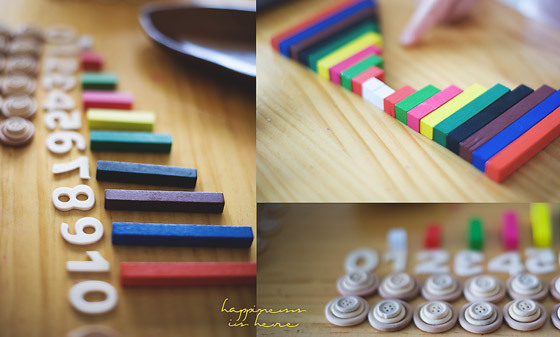 Such engaging ways to explore maths, I love the wooden numbers! 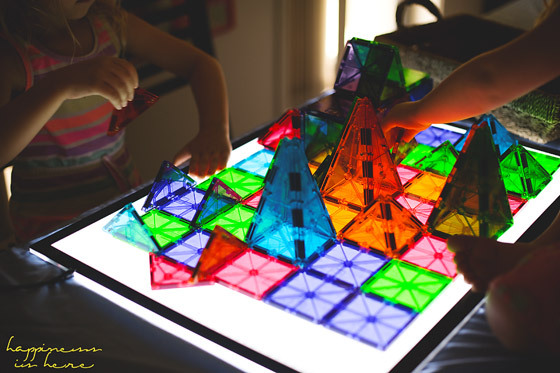 Lots of lovely mathematical learning ideas here – I can just imagine my own girls engaging with these fun provocations.